While we all have differing opinions as to what constitutes “better,” the end goal of this hobby of ours is to improve upon the blank canvas that is a stock car. Some owners will take a subtle path that adheres closely to the original design aesthetic while others will stride a little further from that path to build aggressive and wild cars. Somewhere in the middle of that spectrum of modifiers, you’ll find the VIP style as it delicately balances elegance and extravagance. Wild wheel fitment is paired with classy details and tasteful bodywork to construct a car that has a certain grace in the extreme nature of its styling. When he saw such beautiful cars hovering just inches off the ground, Johnny Dip fell in love with the VIP world. As a 15 year old, he grew up admiring the scene’s "OGs"; learning from their work and collecting inspiration from their builds. 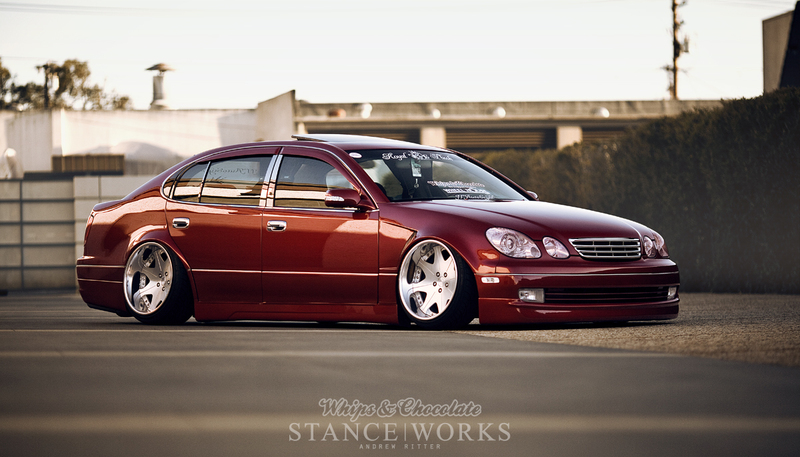 After much anticipation, Johnny finally found himself in a Lexus GS400, one of the staple VIP platforms. In 2010, Johnny was cruising the streets of Southern California in his newly acquired Metallic Silver GS, enjoying the comfort and style that comes naturally to big-body luxury cars. The car stayed stock for a year until his uncle “borrowed” the car and hurried it off to his shop, JT Autostyle. When it returned to Johnny’s hands, it was freshly outfitted with a full Admiration kit. Something about a car with such an attractive kit situated over stock suspension and bland factory alloys didn’t seem right to Johnny so with that, new wheels were ordered and he made the inevitable jump into his build. A set of MRR wheels found their way under the arches as he proceeded to address the wheel gap that the factory had left him. Somewhere between the Car Show fields and the late night parking lot hangouts, Johnny developed a tightly knit group of friends who shared the same passion for "unreasonably" low cars. From these close bonds grew a family that is now known as the Royal Flush Crew. The crew structured itself on the notion of quality and a determination to always push themselves to be the best at what they do. Their philosophy shows as you catch a glimpse of them rolling into shows together and the continued encouragement amongst friends has inspired a group of enthusiasts that push the boundaries with their ever-evolving builds. Although he was happy with how his car sat, Johnny set out to raise the bar on his GS build to stand among the ranks of his fellow Royal Flush Crew members. The flat faces of the MRRs were replaced with the deep flat-lips of the Work Euroline DHs in an impressive 19x11 and 19x12. 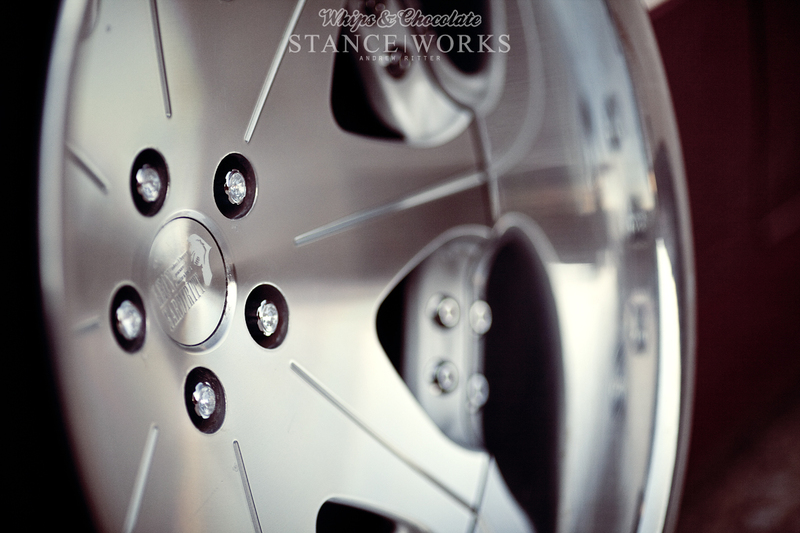 Having bolted on wheels with offsets that fell down into the negatives, Johnny would have to revisit his wheel wells. The fenders received a subtle pull and Universal Air Suspension took the place of his old static setup to fine tune the fitment. With the 12s neatly tucked under the rear quarter panels, the car was painted bright silver with a subtle chrome flake to enliven the body’s lines. Johnny’s vision was taking shape, but it wouldn’t be long before it would go back under the knife to emerge once again as the beauty that you see before you, today. The prior stages had been impressive but its current state is one that captures everyone’s attention. While Johnny will be the first to tell you that he still has plenty still planned for the build, it’s safe to say that it has reached a point where he has found the careful balance of elegance and extravagance that gives the VIP culture its power. This stage is accompanied by negative offsets even more aggressive than the last, but he’s able to pull them off with a careful subtlety that one might not think possible. Much of this can be attributed to the fenders which have been carefully sculpted to tightly hug the new wheel setup. Fabricated entirely from steel, the fenders stretch out away from the old body lines, accentuating and building upon the original design of the Lexus GS. The contour of the widened arch flows into the stretch of the 225/25/19s that wrap the 19x10.5 Leon Hardiritt Waffe wheels up front. In the rear, the 19x11.5s and 245/35/19s nestle themselves into the widened quarter panels as air valves deflate the UAS bags. To an untrained eye, the only hint that these fender lines weren’t born from the drafting boards of Lexus headquarters are the vents that lend a sporty touch to the front end. Dashes of chrome shine nicely against the new red paint with its custom gold flake that shines in the low light of a sunny evening. It’s a color that catches your eye but doesn’t stray too far away from the factory color palettes. In one sense, it embodies feelings of class and prestige with its dark crimson tones, in another it shines to let people know that this bright custom color is Johnny’s doing. JDM window visors, D.A.D. curtains, and D.A.D. neck cushions lend the car its final VIP touches. Johnny has been through many stages of this build and each step has been an improvement on the last. This stage is one that shows careful consideration. 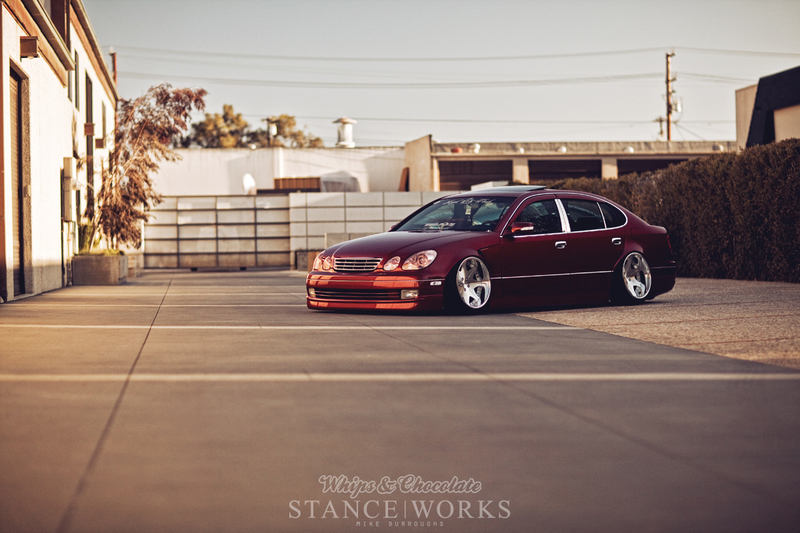 He was able to achieve a fitment that ventures well outside the box but he did so with style and grace that compliments the original lines of the Lexus aesthetic. This car exemplifies the sense of style and commitment that excites me when I attend shows. Johnny has continued to see his vision through and it has really paid off in the most recent rendition. With the encouraging and supportive Royal Flush Crew at his side and a plan in mind, we’re sure this isn’t the last time Johnny will leave us in awe with his GS. We would like to take a moment to thank Whips&Chocolate for working with us to bring you this collaborative feature. 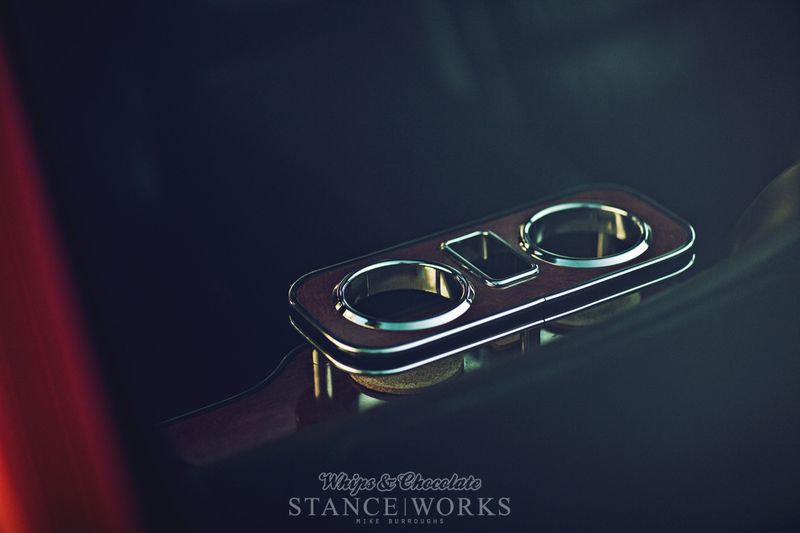 Whips&Chocolate is a pair of gentlemen in Canada who run a blog that celebrates the quality found in the automotive world. Focused on hard work, quality parts, and unique builds, they share some truly inspirational content. Trop magnifique ce model ! LHW wheels purfect – Tumbs up for the shoot ! We featured this car on our Facebook page https://www.facebook.com/sketchysocietyIt looks fantastic! Love the little look at the interior! Traveling in such luxurious car is dream of everyone, but this dream can be full fill in today’s technological either by hiring them through car rental companies like https://ariescarrental.com.au/ and other is to getting finance from financial services that would make dream come true solution to enjoy this beautiful life. I would like it more on coilovers, with air cup suspension (www.stanceparts.com/air-cup-suspension.) With air cup suspension absolutely not.. you just keep the ride quality of your coilovers!